A percussive guitar style and soulful voice complemented with percussion instruments to create rhythms of World Music, R&B, Reggae and Soul, forming a multi-cultural cross of organic beats. 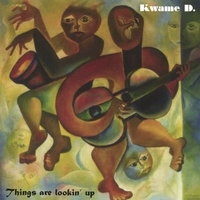 Kwame D. a duo from Leeds, UK, perform a rich variety of Rhythmic Soul, World Music, infectious Blues and Reggae stylings in roughly equal measure. "can't fail to move anyone within earshot!" "…Even though as a duo, Kwame D. are colourful, have great stage presence and the sound of a four-piece band." Their music has its roots from Kwame's Ghanaian background with influences from soul greats such as Curtis Mayfield, Marvin Gaye, Aaron Neville, Robert Cray, mixed with the african style of artistes such as Salif Keita, Youssou N'Dour, Fela Kuti. The latin influence from Santana and The Gypsy Kings, and reggae from Jimmy Cliff and Bob Marley. Jeff's use of percussive instruments such as the Djembe (originally from the Gambia and Senegal), the Moroccan clay bongos, the dolak from India, the Dabourka, Congas and many more, all in combination with chimes and cymbals, set the seal on Kwame's self-developed percussive guitar style, creating a joyous blend. Kwame D continuously tour performing to audiences across the UK.